On the day after the election of Emmanuel Macron, the German weeklies, Die Zeit and Der Spiegel, publish his picture on their cover page. The choice of the person who is to lead France is seen as a major event in Germany, a sign of the strong bonds linking the two countries. However, attention should be given to the captions that go with these photos and their layout. Die Zeit presents Macron with his eyes closed, his head surrounded by a halo, with the headline "Der Heiland", "the Saviour", and the following text: "Emmanuel Macron is now deemed to be Europe's saviour. However, in France he is detested by many, and not only on the right. What are we to expect of him?" Der Spiegel surrounds his portrait in bust with a blue-white-red halo and the following title "Teurer Freund", "Dear Friend" in the sense "costly friend" as the accompanying text states: "Emmanuel Macron saves Europe ... and Germany has to pay", with everything in the French colours. In these layouts we can perceive admiration, relief with regard to Europe, irony and concern: Macron wants Germany to pay. On 22nd January 2018 the Bundestag and the National Assembly met in Berlin and Paris to commemorate the 55th anniversary of the Elysée Treaty and to adopt a resolution in view of its deepening. 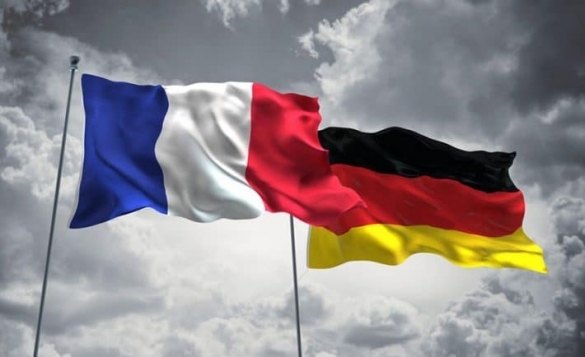 The leader of the National Assembly, François de Rugy, spoke in German to the Bundestag, which met in extraordinary session, declaring "France and Germany are no longer just a couple: our two countries are a family." The hall was full, Chancellor Angela Merkel was there. On the same day, Wolfgang Schäuble, leader of the Bundestag, held a speech before the National Assembly in which he exalted Franco-German friendship as "a legacy of history". The hemicycle was three-quarters empty. Only two members of government bothered to turn up, with the Minister for European Affairs arriving late. An illustration of French flippancy? The relationship between France and Germany, although close, is none the less complicated. It is true that differences are real and of a type to frustrate their relations. Last year, I attended a conference rather dubious about the perspective of this. Without sharing this vision, I should mention a certain number of arguments along this line. France, proud of its seat at the UN Security Council, its operation-ready army, of its nuclear strength and its influence, because of its language and its history, as the nation of the Enlightenment, Revolution and Human Rights, maintains its sight set on the wide world, with privileged zones of influence in the South, especially in Africa. Germany, proud of its economic power and the quality of its products, is reticent about military interventions, has its sight on its continent and especially on Central and Eastern Europe, where its main interests lie, and acts as one of the world's leading export powers. The Germans are easily irritated by the pretentions and behaviour of the one they often ironically call "The Grand Nation", with some going as far as seeing in President Macron's "almost feverish activity" in foreign policy "an effort being made to return the shine to the Grand Nation." German prestige lies in "deutsche Qualität" - German quality - which they believe France is far from achieving. In a dispatch on the trip by Macron to China in January 2018, commenting on his speech to an assembly of businessmen, in which he declared that access to their market was unsatisfactory, the Deutsche Presse Agentur (DPA) highlighted the Chinese response, who suggested that France should first produce better goods if it wanted to export more and quoted a member of the Chinese academy for trade and economic cooperation: "French products cannot compete with those of Germany and the USA". Finally, the agency noted that Angela Merkel was better treated by the Chinese than the French President, although the latter was presented as the "Voice of Europe" . This report, very different from those given in France, bears witness to a certain German condescendence, irritation aside, based on the awareness of its industrial and commercial strength in the face of the new French pro-active stance. In terms of the trade relations between the two countries and their place in world trade, the imbalance, to France's detriment, is as old as the debate that periodically goes with it. The same applies to the employment market. As for the French they are not to be outdone in terms of annoyance, especially in regard to German economic policy, deemed too short term, criticised for taking advantage of the single market and the euro zone, without considering adequate return towards the community of European countries - or in terms of their irritation of having to commit alone to vital armed combat against jihadist extremism in the Sahel. The institutions offer a clear picture of our differences. In Germany, the system is a federal one with 16 Länder, which are not just simple regions, but federated States, that do not hesitate, in the ilk of Bavaria and others, to assert themselves at national level, pushing their own vision through, notably via the Bundesrat; the regime is parliamentary, with parties holding tough discussions, as we see at present, over a government contract that will have to be respected, and a Bundestag that punctiliously monitors the government and its commitments, particularly those involving the military abroad; decentralisation is a firm part of the country's organisation, and instead of a hegemonic capital, urban centres span the territory. In France, the Republic is unitary and, albeit decentralised, the State is highly present in terms of the country's administration; national governance is dominated, except in a period of cohabitation, by the President of the Republic, who has far reaching powers, notably in terms of rapidly engaging the country in external military action. In the management of its public accounts, in opposition to Germanic rigour, we find a certain French flexibility. In corporate governance , the Mitbestimmung, in which staff representatives take part in the management of companies of over 500 employees, faces a French system, which, despite progress, hardly emerges from the confrontation between employers, who are reluctant to share any power, and unions, which have not all taken the path of reformism. In society and the way it functions, there is visible contrast. Germany has a weakness for the culture of consensus, even though it is not always easy to achieve; France prefers rather more the culture of permanent debate and confrontation, which is judged ambiguously by the Germans: they are critical of the trend to strike and the lack of discipline, yet admire the French population's capacity not to bow to authority and to defend its freedoms. Stereotypes are expressed in popular culture. The German freely says "Die Franzosen arbeiten zum leben, und wir leben zum arbeiten" "The French work to live and we live to work." He criticises French frivolity, but also adds, enviously and in slight admiration: " Leben wie Gott in Frankreich"("Live like God in France!") and he is sensitive to French elegance. The French smile at "German heaviness" whilst lauding "German seriousness and rigour". Whilst the French like grandeur, the German privileges prudence; the Frenchman likes to think himself creative, the German ensures that he maintains what he has built up. We might add the difference in demographic trends to the benefit of France, which is reflected in the exercise of posts of responsibility. During my professional dealings with Germany I have often noted that leaders were older than the French. This path, without mentioning their terrible history of conflict, in simple terms, illustrates the differences between our two nations. And yet what a magnificent path travelled together since the end of the Second World War! Without lingering on this issue, we let us evoke some significant times and images along this path: Konrad Adenauer and Charles de Gaulle attending Mass for peace at Reims Cathedral on 8th July 1962, then signing the Elysée Treaty on 22nd January 1963, from which the Franco-German Office for Youth was born; Helmut Schmidt and Valéry Giscard d'Estaing becoming living symbols of Franco-German friendship; Helmut Kohl and François Mitterrand holding hands in Douaumont on 22nd September 1984. One might say that the "Franco-German" couple has played a decisive role in the construction of Europe and mainly shaped Europe as we now know it. Amongst the founding fathers, Robert Schuman, Jean Monnet, Konrad Adenauer occupy a major place. Mitterrand and Kohl with Jacques Delors at the head of the European Commission can be deemed to be key players in the creation of the Single Market, then of the birth of the euro, which was a way of guaranteeing reunified Germany's anchorage in Europe. When Mitterrand and Kohl met, they were able to launch initiatives that the other Members of the Union followed thanks to their capacity for dialogue and agreement. But then circumstances change. Germany reunified, and progressing from economic power but political dwarf, according to an expression at the time of division, it has become quite simply a major European power,. The men and women who are now coming to office in our countries and more generally in European countries have not experienced war. The German capital moved from the Rhineland town of Bonn to Berlin, a city in the north. Reconciliation with the countries of Central Europe, like Poland, seemed to many German MPs, as important as that with France, since economic interests are not absent from this. I realised this when I was on a visit to the German Bundestag as the head of a delegation of prefects in the 1990's. The UK, whose neo-liberal approach has constantly influenced the Union, seems to be a possible ally for Germany in many European debates. In short France and Germany slowly moved away from their close relationship. Then came the crises, poly-crises, as they are sometimes called in Brussels: the financial crisis of 2008, the Greek crisis, the migrant crisis, Brexit. Frequently the French and German attitudes in these periods have not been immediately similar, even though they have drawn closer as the need to avoid a catastrophe has become clearer: French readiness to support banks as soon as the financial crisis started, initial German caution, French inclination to help Greece at the beginning, German reticence at the very start; initial Germany opening to refugee reception, French reticence at being overly generous. Crisis management enabled measures to be taken that consolidated the banking system and the euro, but which did not however lead to the deployment of any further ambition in terms of European integration, since this is being disrupted by populism that is influencing populations, leading to withdrawal in terms of identity and a rejection of any further integration. The situation is now changing again, on the one hand there is Brexit, which is forcing the 27 and particularly France and Germany, to close ranks to define a common attitude towards the UK, on the other, with the new Russian interventionism, Islamic terrorism, Donald Trump's "America First", there is a move in the direction of a "Europe that protects"; finally there were the elections in 2017 in France and the Netherlands that witnessed the failure of populism's bid to take power. The French presidential election in May 2017 gave the country a young president, who immediately positioned himself as a fervent supporter of Europe and of Franco-German friendship in his electoral campaign. However, the elections in the Bundestag in September 2017 have led to a period of political uncertainty in Germany with the significant decline of the parties (CDU/CSU & SPD) that to date have been dominant, with entry into parliament, in third position, of the populist, anti-European party Alternative für Deutschland (AfD), and the return of the liberal party, the FDP. The bid to form a Jamaika coalition between the CDU/CSU, FDP and the Greens failed in November, so that discussions for a new Grand Coalition (GroKo) CDU/CSU-SPD, started, finally leading in February to a coalition contract. This was approved by the party's eligible members (66.02% of 463,723 members) on 4th March 2018. President Macron's speech on Europe, delivered at the Sorbonne in September 2017 found great resonance in Germany. His proposals about the euro, which he took care not to lay out in detail, were noted with particularly attention, although they take up less than a page of the speech's 19 and only feature last in the six "keys" for a "sovereign, united, democratic Europe". Germany's response was both a necessary recognition of the French initiative to revive Europe and reticence regarding these proposals, especially those targeting the creation of a specific euro zone budget and Finance Minister. Likewise, regarding the French idea of allowing countries to move along faster, to make progress as the avant-garde, if they so want, with the others joining them when they want to, Germany emphasises the importance of joint progress being made by of all of the EU's Member States, as does the European Commission. The length of negotiations to form a new government has not enabled the clarification of the German position. The failed attempt to form a Jamaika coalition did however leave room for hope. The FDP's orientations are now Eurosceptic, with a strong drive to prevent "Germany from having to pay" and to request those countries in difficulty, meaning those in the South, to bring their finances under control first. This is the position of Northern Europe. The participation of the FDP in the federal government would have augured badly for President Macron's initiative. The new grand coalition between the CDU/CSU and the SPD opens up considerably more favourable prospects. The Koalitionsvertrag, the 177-page coalition contract dated 7th February 2018, is entitled "Ein neuer Aufbruch für Europa" "A new start for Europe" and devotes its first chapter to this issue (which only featured in 6th position out of 8 in the 2013 contract), thereby purposely referring to the partnership with France to consolidate the euro zone. It endorses the creation of specific financial means for this zone in view of economic stabilisation, social convergence and support to the reform of structures, with the perspective of a future investment budget; it provides for the transformation of the European Stability Mechanism (ESM) into a European Monetary Fund. Referring to the emphasis placed by Mr Macron on "decisive, concrete Franco-German impetus" a specific paragraph is devoted to the strengthening and renewal of Franco-German cooperation, with the signature of a new Elysée Treaty. An attentive observer will note that in the following paragraph stress is placed on the particular significance of the German-Polish partnership. Some positive prospects have therefore been opened for our cooperation in the sensitive area of European currency and finance. However, Germany, as it states in the coalition contract, is still specifically attached to the Stability and Growth Pact that obliges the States of the euro zone to making strict budgetary efforts, and regarding its own finances, Germany recalls its drive for a balanced budget, without any further debt and a reduction of its debt below the 60% mark of its GDP. If the fact that the post of Finance Minister should be given to an SPD member, this suggests that Germany will change in relation to its position over the "diktat of austerity" in Europe, according to Martin Schulz, the budgetary order will remain its main guideline. Another central issue in the European plan, that of security and defence, deserves our attention. Mr Macron presented security as being the first "key" in his Sorbonne speech. He would like to strengthen cooperation to counter terrorism and to develop cybersecurity. In terms of defence and as a complement to NATO, he set the goal of achieving Europe's autonomous operational capacity. He would like that at the start of the next decade for Europe to have a Joint Intervention Force, a common defence budget and a common doctrine regarding action. He is encouraging a rapid introduction of the Permanent Structured Cooperation (PESCO) and the European Defence Fund, decided upon in 2017, complementing these with a European intervention initiative, enabling a better integration of the armed forces at all levels. Although cooperation within the European framework to counter terrorism and cyber threats has been tightened considerably with this continuing to develop, cooperation in terms of defence is a more sensitive issue. France's traditional partner, also able to intervene rapidly in world theatres, is the UK, since relations with Germany, despite initiatives like the creation of the Franco-German Brigade, are not reflected in the operational area. There is a gulf between the strategic cultures of the two countries. Although the Federal Republic is aware that it has do more in the face of threats and in regard to its responsibilities, it has developed, within its political class and its population, a "culture of restraint" . Parliament's careful control of the deployment of troops outside of its borders is part of this mind-set. This position has of course evolved, via Germany's intervention in Afghanistan and in the fight to counter Daesh in the Middle East. However, although German troops have been deployed significantly in Mali, they do not take part in armed combat against the jihadists, unlike the French. The permanent structured cooperation (PESCO) decided upon by 25 Member States, likewise the European Defence Fund launched by the Commission, is a real step forward for Europe Defence, but it does not tally with the French goal of creating a hard European core that is capable of operational combat deployments. It is the German vision that has prevailed in the drafting of the PESCO, which includes nearly all of the Union's Member States, i.e. that of a joint development of military capabilities, but without any operational target. In the coalition agreement a petition of principle has been set: "We want to remain transatlantic and become more European." . Germany would like to strengthen cooperation within the PESCO and use the new instrument, in the shape of the European Defence Fund. It supports a European Chief-of-Staff for the conduct of civilian and military operations, a project that the UK constantly impeded. Cooperation with France is explicitly quoted, but also with the Netherlands and Norway. At the end of the day NATO remains the fundamental part of its defence policy. In short, both regarding the single currency and defence, the desire to cooperate closely with France has been declared, but without agreeing on many specific proposals that the latter has made, remaining loyal to the fundamentals of German policy. Of course, we should not limit the prospects for Franco-German relations to these fields alone. In other areas, such as for example, that of posted workers or the coordination of labour market policies, rapprochement is now visible. With the formation of the grand coalition we might therefore hope for a deepening of the Franco-German relation in the direction of a Franco-German economic areas with rules that are more harmonised and common European renaissance. And this without national specificities dissolving in this process. It is now hoped that the sequence of German political uncertainty is over, including in regard to the quality of our relations, because although President Macron's action is the source of fascination, it also causes irritation. In a dispatch mid-February, the DPA deemed it useful to quote Dan Coats, the Director of American National Intelligence, who declared during an audience in Congress: "Europe's centre of gravity seems now to be leaning towards France". This kind of information, highlighted in this way, is barely of a nature to convince our German partners. This said, to foresee our future relation, we must also consider the renewal of our political classes. In this regard, although the role of Christian Lindner (aged 38) at the head of the FDP might raise questions, the appointment, that has just occurred, of Annegret Kramp-Karrenbauer as the CDU's Secretary General, a Saarlander who is extremely committed to Franco-German cooperation, can only be deemed to be positive. To conclude this section, I would like to point to another possible conception of the Franco-German relation, which takes into account the direction of History. If this moves towards a world in which international relations are dominated by continental sized powers, such as the USA, China, Russia, India, Brazil, in which Europe holds on to its place, then it would seem that European integration will be irreversible and Franco-German cooperation inevitable, beyond the hiccups suffered by the couple and their electoral episodes. However, can we say that this is the direction that History will take? Even though there are signs of this, it is difficult for those involved to recognise this. Symbolism has its place in History. As Emmanuel Macron said in his speech in the Sorbonne: "Europe is also an idea - Europe will simply live because of an idea ..." To live, the Franco-German friendship, the foundation of Europe, itself needs to be an idea, to be marked by symbolism. We should remember the high points of our journey together. We should also recall that France and Germany were "born of the same territorial construction, the Carolingian empire"and that both countries only formed as separate political entities after a long process, as of the middle of the 9th century, continuing until around 1050. To those who want to know more I would recommend the book by Carlrichard Brühl, "The Birth of Two Peoples - the French and the Germans (9th-11th centuries)", that German historian who belongs to the academic world of both of our countries. Simply, but evocatively we think of our shared Charlemagne - Karl der Grosse - who is buried in Aachen/Aix-la-Chapelle, the Treaty of Verdun in 843, which gave rise to East Francia, the future Germany, and to West Francia, the future France, as part of the Carolingian empire, which kept one emperor, Louis the Pious, who was the recipient of the middle part, and finally that France bears the name of a Germanic people, the Franks. This historical interlude leads me to the Oath of Strasbourg, the first bilingual document in Old French and Old German, whereby in 842 Charles the Bald and Louis the German joined forces against their brother Lothar, an alliance that led to the Treaty of Verdun. Why not sign a new Oath of Strasbourg to renew the Elysée Treaty, but this time not to divide but to unite, to sanctify the friendship of our two nations? This would be a strong symbol. It was about Strasbourg and Alsace that our nations launched battle that Europe was torn apart, and it was there, that it came together again. Although Brussels might be city of European technicians, who are vital of course, Strasbourg is the city in which the heart of Europe beats and we must not abandon the symbolic field that it embodies. In this new Oath our nations might offer the Union land spanning either side of the Rhine, on which we might build, by the continent's most reputed architects and artists, a palace of Europe, open to ceremonies such as the taking of office of the new leaders of the European Union or the reception of ambassadors, with the emergence of a specifically European ceremony. This palace would host a museum devoted to European integration as well as our continent's civilisation, in its diversity and unity. I have presented this proposal to each of our presidents of the Republic since François Mitterrand, sometimes receiving a warm reply, but there has never by any follow-up. I have submitted it to our present President, who was kind enough to say at the reception of the prefectural corps on 4th December last: "I have a paper written by you on my desk"... Let us wait and see. Conference at the General Assembly of the French Association of the bearers of the German medal of Merit (AFDMA), Paris, 20th February 2018. "Emmanuel Macron gilt nun als Retter Europa. Doch in Frankreich ist er von vielen Menschen verhasst, nicht nur unter den Rechten. Was haben wir von ihm zu erwarten?" "Emmanuel Macron rettet Europa...und Deutschland soll zahlen"
 EuroDéfense breakfast debate with Hakim El Karoui, 16th May 2017, La relation franco-allemande, quelle perspective? Berliner Morgenpost, 15/01/2018, "Macron plant den Durchmarsch": "Und außenpolitisch? Auch oder gerade dort legt der Franzose eine beinahe fieberhafte Aktivität an den Tag, in dem Bemühen, den verblassten Glanz der Grande Nation neu aufzupolieren." "And in foreign policy? Also, and precisely there the Frenchman is deploying almost feverish activity in an effort to bring back the shine to the Grand Nation"
 DNA of 11/01/2018, "Peking "Pferd schlägt Drache?" China lässt Macron auflaufen." "Beijing, horse slays dragon? China takes Macron for a ride." The expression and analysis are taken up in the article "Europe and Defence: The vital yet fragile Franco-German couple" by Thierry Tardy, senior analyst at the Institute for Security Studies of the European Union, published in the Robert Schuman Foundation's letter on 11th December 2017 European Issue No.455. "Wir wollen transatlantisch bleiben und europäischer werden", p. 144 of the Koalitionsvertrag.